Looking to learn a new instrument but don’t know where to start? Even thought about learning the violin? We wanted to find the world’s best violin brands, so we spent days researching and reviewing all of the best violins. After that, we compiled all of our favorites and made a top ten list. Now we have a list of our favs, and we’re excited to share them with you! When looking for the best violins, we also put together a list of stats that can help you to pick out your favorite. Here is a list of those stats with a brief explanation. Size - How big is the violin? We’ll let you know what the size it is. 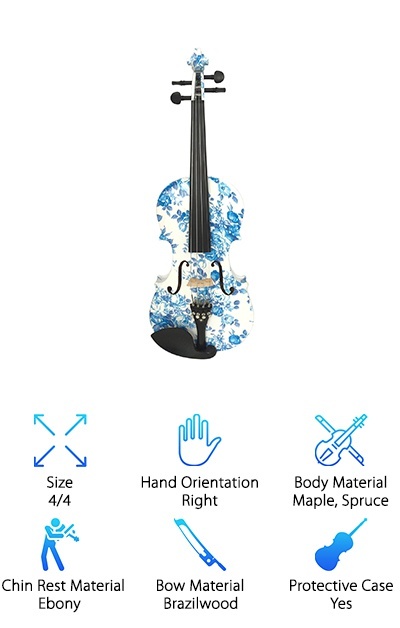 The smallest sizes start at 1/16, and the largest size is a 4/4 full-size violin. Hand Orientation - Was this instrument designed for right- or left-handed people? The orientation will be different, so make sure to get the right hand. Body Material - While most traditional violins are made from wood, not all of them are nowadays. We’ll let you know what the body is made from. Chin Rest Material - What is the chin rest of the violin made from? Traditionally made of wood, some of them are now made from durable plastics. Bow Material - Although violin bows were traditionally made from ivory and horse hair, many are now made from more synthetic materials. 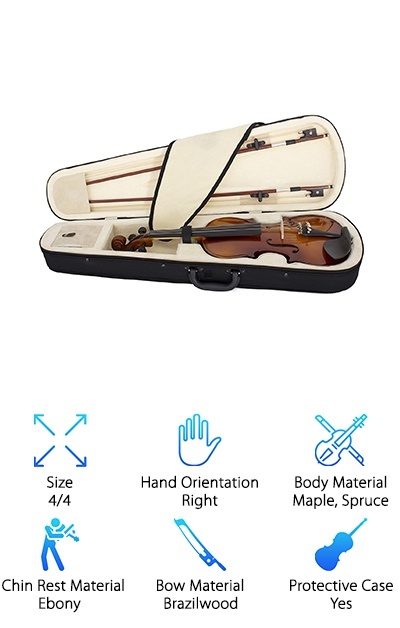 Protective Case - Does the violin come with a case? Violins will be need to be protected with a case, but not all of them come with a case. Now that we’re done with the stats, let’s move onto those violin reviews. We loved all of these instruments, but there were two that really stood out from the pack. Those two are the Top Pick and Budget Pick. The Top Pick was our favorite overall. The Budget Pick is a great violin for those of you on a small budget. If you’re in a hurry, make sure to take a look at those two first! Now let’s get to those violin reviews! If you are looking for a classic, full-sized violin with a great voice that’s made with quality materials, then check out the Kennedy Bunnel Violin. This violin is very highly rated and is such a great instrument. Covered by a lifetime warranty, the Kennedy Bunnel Violin is classically colored and made from maple and spruce woods. It comes in a hard, protective case lined in in soft fabrics. It comes fully assembled and ready to play. All of the fittings are 100% genuine ebony, and the bow is made from horsehair and Brazilwood. And you also get rosin and strings with your purchase too! They are D'Addario Prelude strings, and if you read the violin string reviews, these strings are of a great quality too! We love this violin; that’s why we made it our Top Pick! The reason we think that the Mendini MV300 Antique Violin is the best violin for beginners on our list is how inexpensive it is. This instrument is incredibly cheap, making it a great starter tool for a child or new musician that isn’t sure what instrument they want to learn yet. Although inexpensive, this violin is made with quality spruce and maple. It comes with a very lightweight case that protects it from rough handling, a Brazilwood and horsehair bow, rosin, an adjustable shoulder rest, two bridges, and an extra set of strings. In other words, everything you need to get started! And to top it all off, the Mendini MV300 Antique Violin comes with a one-year warranty to protect you against a defective product. So if you or someone in your family is looking to get into the violin, the Mendini MV300 is a great starter. The Cecilio CVN-300 is another great starter violin for anyone looking to learn a new instrument. This one is full-sized, but it also comes in ¼, ½, and ¾ sizes as well. It is made from spruce and maple with all ebony accents. It comes with four, detachable, nickel-plated fine tuners, and it comes strung with quality, D'Addario Prelude Strings. 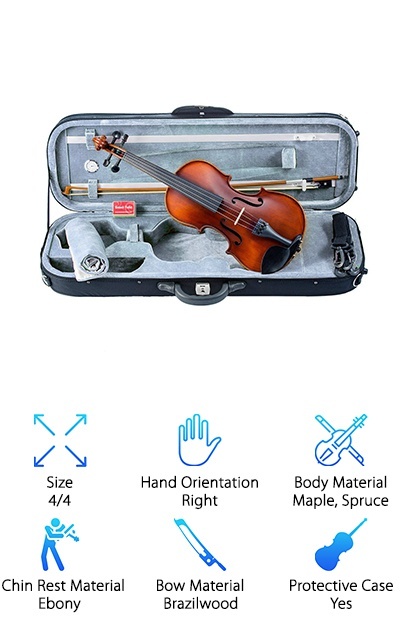 This beginner’s violin also comes with a case, two bows, rosin, extra bridge, and a lesson book to help get you started. All of this is covered under a one-year manufacturer's warranty, too. The wood has a deep, mahogany color that is rich and glossy. The sound quality and look of this violin makes it seem like it’s a much more expensive violin. And we also love that it is lightweight enough for even younger players to be able to handle! 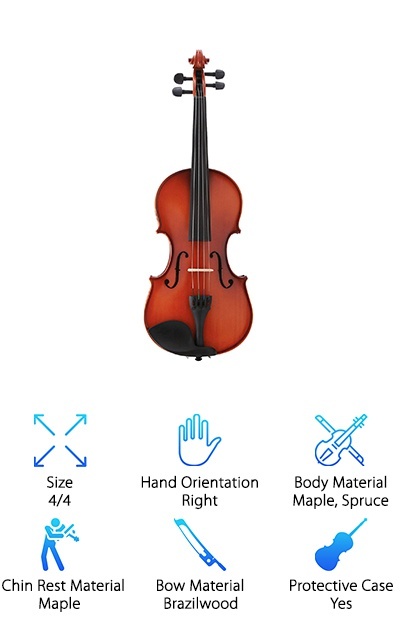 The ADM Violin Starter Kit is one of the best beginner violins for new students with attitude! If you are looking for something a little different, you’ve come to the right place. This bright blue violin looks like nothing you’ve ever seen before. This quality maple and spruce violin is then painted a rich, royal blue and covered with a high-gloss shine. The handcrafted neck, back, and sides not only make this piece unique and beautiful, but it also adds stability and a better voice to the instrument. This instrument only comes in full-size, so it’s not for kids that aren’t full grown yet, but it is perfect for young adults and teens who are just getting into string instruments. We’ve never seen a prettier instrument! Need a great starter instrument with a strong voice? The Kaizer Violin 1000 Series violin was designed with students in mind; it is hand-carved maple and spruce inlaid with beautiful purling by hand. This violin prides itself on being ethically sourced from Asia and Europe; the wood is free from harmful materials. It’s also a complete kit, featuring such delightful added features as a horsehair bow, a molded case, shoulder rest, an extra bridge, and an extra set of strings. The exterior of the body is rich honey color, coated in a quality finish that makes this a beautiful instrument. But the best part is that some versions of the kit come with a camera to help you record yourself playing. This will allow you to see yourself progress and help you to improve your form! Wow! What a stunning violin! The Kinglos Solid Wood Violin is a beautiful, floral-patterned violin that comes in two amazing color combination. One is a blue and white floral pattern, reminiscent of blue china. The second is speckled with gorgeous blue and orange flowers wrapped in greenery. These two are visually stunning, their color deeply ingrained in the wood with a special, patented technology. But not only do these violins look beautiful, they also sound beautiful too! Made from spruce and hand-crafted maple, the Kinglos Solid Wood Violin is strong, stable, and has better quality sound than instruments made of lesser materials. The fingerboard, pegs, chinrest, and tailpiece are all made from quality ebony. This is truly a wonderful, unique piece that will make a beautiful addition to any music lover’s home. Need something smaller? 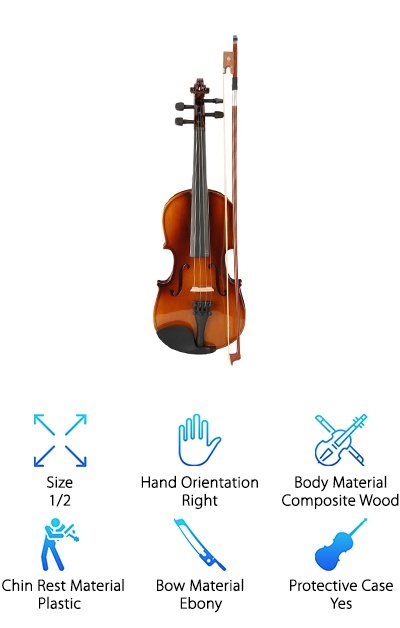 The MicroMall Violin is a ½ size instrument, suitable for children around 10 years old. The body is made from inexpensive composite wood while the details are made from durable plastic. This violin is a beautiful honey color, and it comes with an ebony and horsehair bow. This bow is perfect for children who might be a little rough with their instruments. It’s very inexpensive, giving even families without a big budget the joy of music. 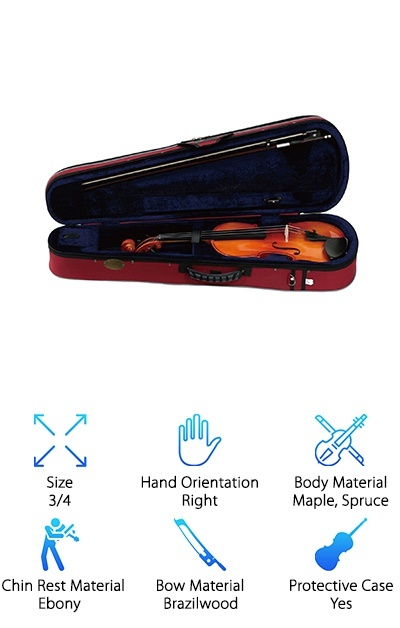 It even comes with a carrying case to help keep your child’s new instrument protected. Since they grow so quickly, buying an expensive violin for a small child isn’t always in the budget. But this is a great transition instrument that will hold them over until they are able to handle a full-sized one. Another awesome violin for young students! ¼ sized violins are perfect for some of the youngest musicians. This is a great size for your young, elementary school child. The sound is beautiful, pure, and warm, coming from a handcrafted maple body. The warm mahogany color of the body is coated to shine. The fingerboards, pegs, and chinrest are all made from ebony while the tailpiece is alloy. This violin has four integrated fine tuners to help get the perfect sound every time. This kit also comes with a bow, hard case, rosin, shoulder rest, and a fingerboard sticker. 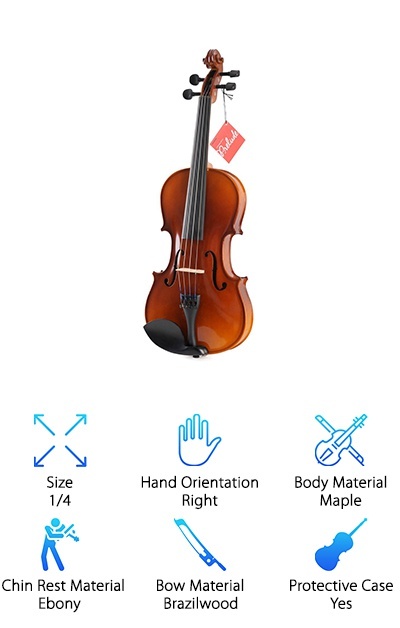 And the MicroMall Violin comes in a variety of sizes too, for when your child begins to grow. We really love this violin for kids, and we’re pretty sure your talented little child will love it too! One of the few sizes we haven’t covered yet in this top ten list is the ¾ size. 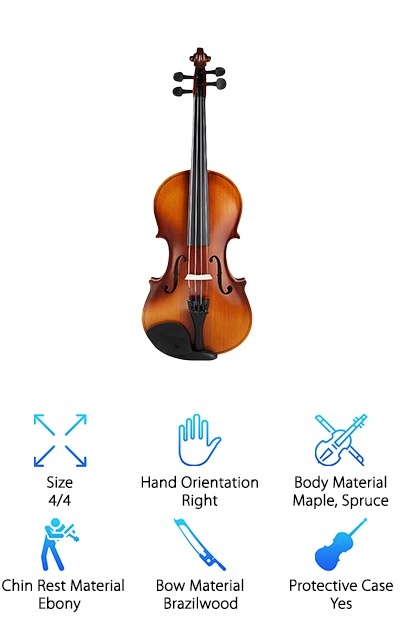 From one of the best violin brands for beginners that have arm lengths of about 22 inches, the handcrafted Stentor ¾ Violin is a great choice for your little musician! It’s handcrafted with fine-grained spruce. The back is a solid maple with ebony fittings. It comes with a quality Brazilwood bow and rosin. It is a great, high-quality violin that won’t let your child down. It’s a little more expensive than most of the other smaller violin models, but it really makes up for it in sound quality and beauty. One of the little details about this violin that we really love is the case! Molded and lined, this case is durable and comes with shoulder straps. That means you can wear it like a backpack! What a great idea! Want to be able to choose your color and size? 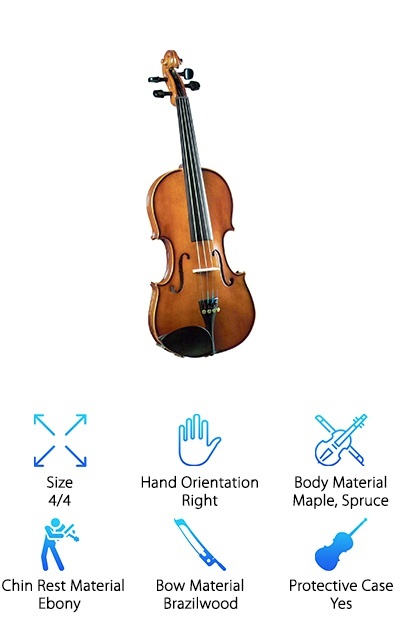 The Cremona SV-130 Novice Violin comes in seven different sizes for everyone from kindergarteners to adults. It also comes in seven different colors, including traditional, sparkling purple, sparkling black, and more. That’s tons of combinations! These violins are fitted with proper string spacing and a low-profile Kaufman chinrest. It features quality Prelude strings, Swiss-style pegs made from ebony, and tons of other little details that just make this a great student violin for children and adults. These instruments are hand-carved and made one at a time, making sure each one is as perfect as possible. The lightweight design ensures easy handling and great sound. We really love these violins, and we’re pretty sure you or your child will love them as much as we do!